After a fire devastated Notre-Dame Cathedral on the evening of April 15, French president Emmanuel Macron announced an international fundraising campaign to raise money to reconstruct the historic building in its entirety. François-Henri Pinault, Kering chairman and CEO, has already pledged 100 million euros to the restoration efforts, and Bernard Arnault, LVMH CEO, has donated 200 million euros. 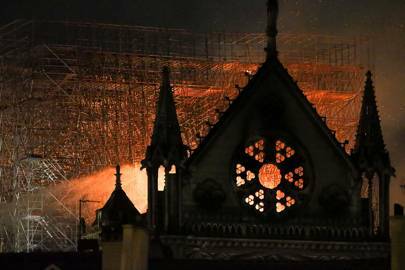 Franck Riester, culture minister, said it was too early to determine exactly which pieces of art had been damaged, but that many of the relics had been removed from the 12th-century cathedral as firefighters worked to control the blaze. He shared photographs of officials loading art into vans via Twitter. His message was no doubt directed to the thousands of onlookers gathered on the left bank of the river Seine watching the flames rise high, and listening to the sound of the spire collapsing on one of the world’s most famous tourist destinations which attracts 13 million visitors a year. 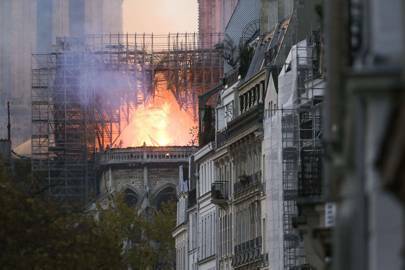 A meeting of experts and national architects is due to take place on the morning of April 16 to consider whether the building is stable and whether fire officers can set up inside to continue their work, according to Laurent Nunez, junior minister of the interior.